Big thanks for iRadio for covering our Sack The Suit campaign for their Feel Good Friday new slot last week. It’s in aid of SVP – Society of St. Vincent de Paul Ireland. There’s been a great reaction to the campaign with companies from all the country getting involved and running clothes’ drives. They’re desperate for clothes, so if you’d like to get involved too, just call 016876996 and we’ll send you some sacks. Our ‘Sack The Suit’ campaign is proving a huge success, with companies all over Ireland signing up to donate clothes to St. Vincent de Paul. The campaign has attracted the interest of the media too. Here is our CEO Gordon O’Neill being interviewed on East Coast FM’s long-running morning show. To get you company involved and run a ‘Sack The Suit’ clothes’ drive in aid of St. Vincent de Paul, then give us a call on 016876995 and we’ll send you a welcome pack. 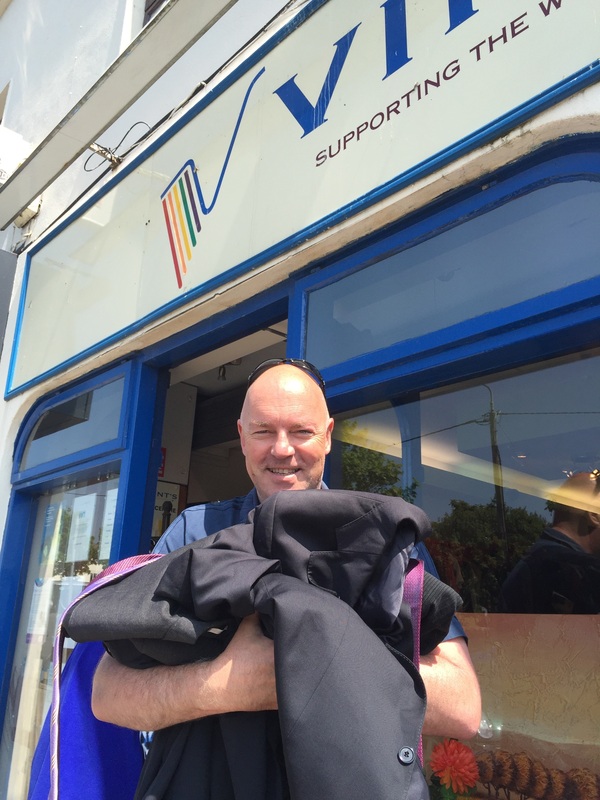 Join sack ‘Sack The Suit’ in aid of St. Vincent de Paul. 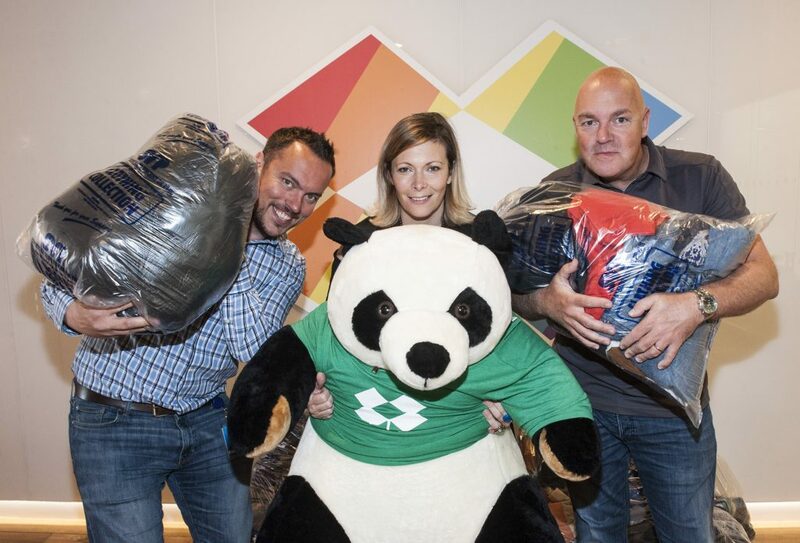 Pieter Jannssens (Dropbox), Nichola Mullen (St Vincent de Paul) and Gordon O’Neill, (CEO of Goldfish.ie) with Dropbox’s mascot ‘Panda’ in their Dublin HQ for the launch of the ‘Sack The Suit’. A couple of weeks ago we launched our ‘Sack The Suit campaign with Dropbox in aid of Irish charity Irish St. Vincent de Paul. The response has been huge, with companies across the country getting involved. But we still need more. St Vincent de Paul are desperate for clothes and let’s face it, we all have clothes hanging at home that we’ve not worn in a while, so why not clear out that space for a good cause. Whether your company is planning to sack your suits for the first time or has already sacked off your suits, why not join our campaign and help St. Vincent de Paul? 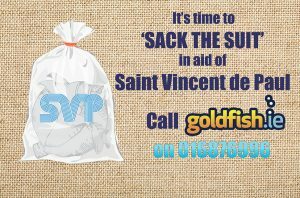 Call 016876996 or email simon.palmer@goldfish.ie and we’ll get some sacks sent out to you. Companies that have already joined Sack The Suit include: DropBox, Hayes Mcgrath, Metabolomic Diagnostics, O’Neill Healthcare, Beach Hut PR, Newswhip , Currency Fair and Scurri and more. Pieter Jannssens, Dropbox’s Head of Mid-Market Sales, Central and Northern Europe with Nichola Mullen, Head of Fundraising for St Vincent de Paul and Gordon O’Neill, Founder and CEO of telecoms firm Goldfish.ie and Dropbox’s mascot ‘Panda’ in Dropbox’s European Headquarters in Dublin for the launch of the ‘Sack The Suit’ charity campaign, in aid of The Society of St Vincent de Paul. 15th August, 2016; Dublin, Ireland: With Ireland having an unusually warm summer, we are seeing people across the country sweltering at work in their traditional office attire of suits, ties and formal dresses. Thankfully help is at hand from Irish business telecoms firm Goldfish.ie, who are asking companies to modernise their dress-codes, by ditching rules that require staff to wear formal business clothes, and donating them to charity instead. Catchily entitled ‘SACK THE SUIT’, the campaign is being launched across Ireland today. It calls for men and women alike to raid their wardrobe and donate their unwanted clothes to a good cause, the Society of St Vincent de Paul (SVP). The first company to join the campaign is leading file storage firm DropBox, who have already adopted an informal dress-code at their headquarters in Dublin and have just completed a clothes’ collection in aid of SVP. Summer is here and whilst many companies temporarily allow a relaxation in their dress codes during the warmer months, at Goldfish.ie we’ve decide to permanently adopted a casual dress code. Our CEO Gordon has wholeheartedly taken this approach on board by even getting rid of all his suits and ties. Yes, all of them. They’ve all been donated to St. Vincent de Paul. Gordon doesn’t need his suits and ties anymore as Goldfish.ie is not a ‘suited and booted’ company. So they were just taking up much-need wardrobe space. During the hot spell Ireland has been having Gordon has even been wearing shorts to the office, as have many of his staff. We’ve even a hashtag on Twitter #shortswatch monitoring this bare-legged approach. We are now asking all out customers to sack their suits too. We’ve already modernised their telecoms and now it is time to modernise their dress codes. 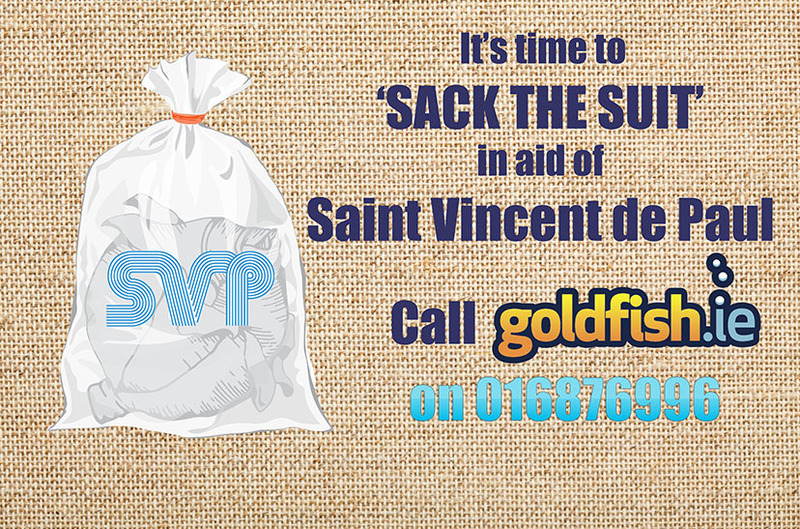 For any company that wants to take part we’ll send them some St Vincent de Paul sacks to fill. 1. It’s 2016 stop dressing like a gangster from the 1920s. 2. It’s the summer, no one should be subjected to wearing a suit and tie. Formal attire is hot to work in and can be uncomfortable, which leads to a drop in productivity. 3. It makes good business sense: suits and ties strangle creative thinking and harm business development. To be creative you need to be relaxed and you can’t do that dressed as a stiff. There is a reason creative companies have relaxed working practices. 4. It’s also good for recruitment: staff like to be in companies where they are treated like adults, instead of made to dress like school kids; you’ll find it easier to recruit good staff if you have a modern working environment. 5. The cost: formal attire is expensive and wears out quickly. Your staff will appreciate you for not making them buy expensive clothes that they only wear for work, weddings and funerals. How can companies join Sack The Suit? We are in the process of agree a charity as a partner on the campaign, but until then they can just give us a call on 016876996 and we will get some sacks sent out to them.